Rayne Hall Farm is just on the western edge of Braintree, near Colchester. Officially in the book it’s a 750m grass strip. Never, ever, trust the published length at a farm strip. Like every farm I’ve ever been to, the published length isn’t really the sensible landing distance available. When you measure it, you’ll find its around 450-480m of quality farm strip, after that there’s a ‘farm track’ that cuts straight across the runway and the runway down slopes – so as you might imagine the care and general quality of the grass in the latter section drops dramatically. To that end my personal objective of coming here was to ‘be stopped by the entrance to parking’ which on runway 27 is 450m. A lot of farm strips need you to be stopped in sub-400m, so I like to practice. Flying in light/general aircraft is not like flying in a jet. Some people will get 1000ft up, experience a bit of light turbulence and begin to feel motion sick (thankfully I’ve never had anyone genuinely go this far on me) – the instructors see this with trial flights quite a lot and it’s why the planes have sick bags in the seat pockets. That’s just flying around generally. Farm strips look from the sky like you’re about to land in someones back garden (and you basically are half the time! 🙂 ). If you’ve never been in a light aircraft before, your first experience being an approach into a patch of grass in the middle of a field heading for some rapidly looking quite large trees/hedges/roads/pylons etc. isn’t going to make for the happiest of campers. So as a rule I don’t fly into farms with anyone I’ve never flown with before. My passenger today had been into Sywell’s Grass 600m runway with me before and handled that ok, so I was pretty sure they were going to be just fine. Always brief your passengers, it’s your duty of care for their safety that they know where the propeller is, how to close the door, dangers at airfields etc. etc. A quick chat of the route, dangers and alternative plans later we were all good. Permission to go into short strips is a bit more tricky to get these days, more forms to fill in for the land away, but I probably fly more farm strips now then most others at the aero club so I’ve found the revised process a bit rough round the edges (verbal permission is a strange thing if staff aren’t around or the instructor on the day who’s signing out hasn’t been told etc. etc.) but it’s beginning to work. As with any new thing, it takes time for things to just settle down. Land Away paperwork approved and lots of signatures in boxes, we’re good to get going. Rayne Hall is a fairly easy navigation and being so close to Braintree should be an easy strip to locate once in the vacinity. Essentially from Cambridge it’s a flight down to Sudbury, then head south west down to Braintree and on the approach to Braintree you should be able to see the farm strip on the right hand side as you approach (if you can’t, perhaps it’s the wrong town! 😉 ). That all makes it sound simple enough, but you can see on the chart that it’s not quite a simple as that. 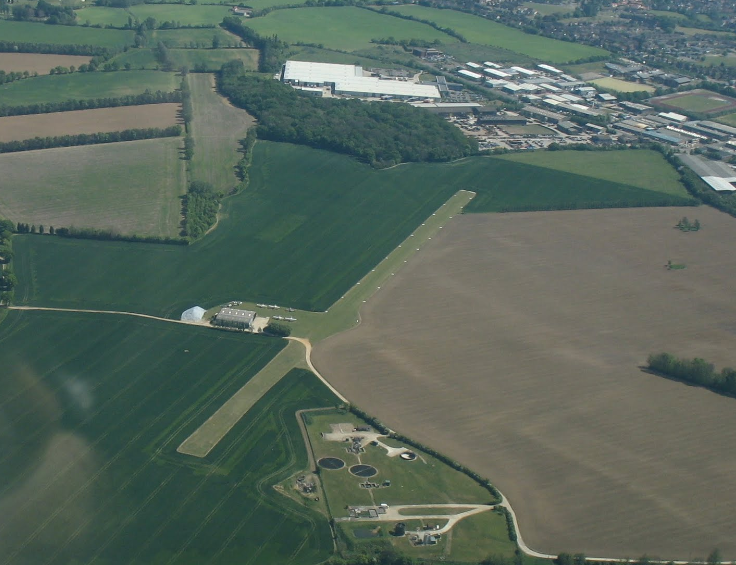 Rayne Hall is located below London Stanstead Control Area (CTA) which extends from 2000 – 3500ft above mean sea level. The elevation of the ground around there is ~200-300ft, we want to be about a 1,000ft above the ground as we’ll be flying over built up areas. So heading south the flight needs to happen around 1,500ft above the sea level. Leaving 500ft to play with to ensure we’re clear of breaching Stansteds airspace – that should be plenty, but you’d be amazed if you take your eye off the altimeter on a nice day how easy it can be to gain a few hundred feet. I’m not asking for any Traffic or Radar service from them, but it’s better to be on a Basic Service with someone who is operating a radar, then it is to be on a Safety Com frequency or a basic service with someone without a Radar. You’d be amazed how helpful radar operators can be if something fast is seen to be coming your way! The down side to this plan is of course that Essex Radar are a busy lot, it’s important to not mess them about and be clear and concise on who we are, where we are/we’re going, when we plan to be there and what we want etc. The final thing you can see in my chart that is probably not very ‘normal’ for those learning, is all the other markings and scribble on the map. I don’t fly these routes with a plog, I fly them with everything on the map (Wind/headings/Radio Frequencies/Max Drift etc.) and my Torgoen T7 watch which has a flight computer on it. I love this watch, I should do a post about it. Getting going was very uneventful, the usual last ‘are you ok?’ checks with my passenger and then we were away and soon in the sky over Six Mile Bottom. I’ve been flying about four years now, I’ve never eaten anything in a plane (when I was learning I was too busy trying to fly the thing!). However, my friend had bought some chocolate at the club and as the flight settled down into what is basically a 15 minute level and easy flight to Sudbury that I’ve done a heap of times, he took this opportunity to offer me a bar of chocolate!! Hmm this could be tricky, but as it was melting and it would be a shame to waste good chocolate, I made it work 🙂 The only catch with eating in light aircraft are the microphone booms get in the way, if you want to say something between mouth fulls you need to keep moving the mic. My Sennheiser HME-110’s passed the test though. The trip down to Sudbury is a pretty easy non-event, you can check you’re over it by the industrial estates on its north and east sides. Calling up Essex Radar they were a bit busy, but happy to entertain a basic service for us – to no surprise we were instructed to stay below their Control Area (CTA), at least they knew what the blip on the radar, soon to be pointing directly at them, was all about now. Heading south from Sudbury it soon became apparent the wind forecast wasn’t quite right (you’ll come to realise this isn’t uncommon). 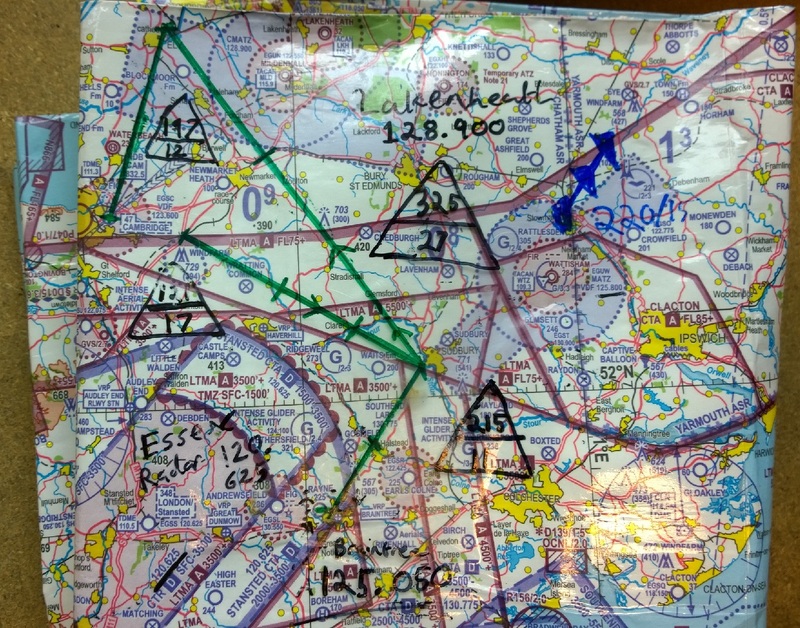 Flying down to Halstead, I knew from my chart if Gosfield disused airfield was anything but on my right, I was too far west. It soon became apparent I was about to flight right over Gosfield, suggesting we were about 1-2nm off track. Not a massive error, but 3 more nautical miles west and then we’d be breaching the northern, lower, part of their CTA, so a minor bit of re-positioning required to get Gosfield on the right hand side. If you’re going to re-position it’s good to do it over a known landmark like this, Gosfield on one side, Halstead on the left, you know really accurately where you are. Finding your farm strip is all well and good, tick in a box we’ve not used any GPS so we’ve had half the fun – but the rest comes from getting it landed exactly where we want the plane to touch down and stopped with plenty of distance to spare ideally. Obstacles – there’s almost always some, usually lots. All of the above can distract you…..don’t let it! Approaching Rayne Hall, I announced my joining intentions on the Safety Com frequency with ‘Rayne Hall Traffic’ prefix. Expect to just get silence back at most farms, but that’s no reason not to make the call. Where did that come from!! Completing a turn and beginning to finish the descent dead side to start a crosswind join of a right hand circuit for runway 27 we suddenly got overtaken by a Ultralight buzzing past the left window! [Rules of the Air at this point state that as I’m on their right, I have priority]. See above, short strips attract stuff that can land in short distances – but at least now I’m visual with it, I can probably cope with the stuff I can see (but where the heck is it going because I’m flying a perfect circuit and it’s just come past us and buzzed off to the north and isn’t turning…). Turning on to base leg I lost visual with the ultra light, it was somewhere north east of our plane. Still no longer visual with them and with a clear final ahead of us down to Runway 27 I turn on to Final for approach to land. Another radio call to declare we’re now on final. My attention must now turn to landing: Runway, Airspeed, Runway, Airspeed….. these really are the only two things you want to be focusing on. It should look and feel calm, but your work load is still at basically the highest it’ll be for the whole flight in this last stage. An aircraft landing or on its final approach to land shall have the right-of-way over other aircraft in flight or on the ground or water. An aircraft shall not overtake or cut in front of another aircraft on its final approach to land. So imagine my gasp of “What the hell are they doing! !” as, maybe 50ft off the ground, the ultra light comes buzzing past my left window. Absolutely no need…. Don’t let yourself be distracted by this sort of stuff, fly the plane first and foremost. Pulling back on the controls the airspeed drops gently through 49 knots, into ground effect and the main wheels touch down maybe 10 or 20 m into the start of the runway. Brilliant! Touching down at the speed you want, where you wanted on a grass strip is always such a great buzz. Landing at a big long concrete runway just isn’t the same. By the time we’d got the engine shut down, the ultra light had gone round and landed. We went over to chat with the owner. It was interesting to hear they were of the opinion that we’d cut them up on the downwind. Explaining that we’d done radio calls, they pointed out they didn’t have a radio – I figured there was not much point making enemies about it all, asking why they decided to then overtake us while we were 50ft off the ground on final approach wasn’t going to change anything. You’ll find facilities at farms tend to be the owners kitchen or if you’re really lucky like at Rayne Hall there’s a hut structure (this is one of the nicest kitted out farms I think you’ll find actually, it has basically a club house, very nice). Still a friendly resident soon sorted that out. 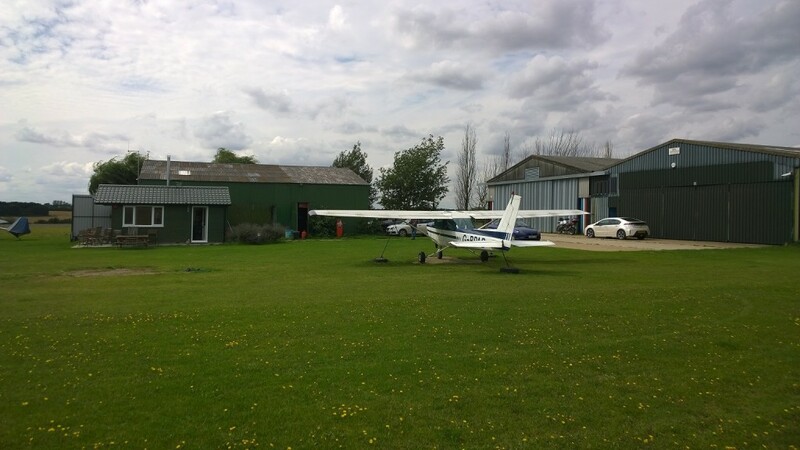 There’s a landing fee at Rayne Hall – this is unusual at farm strips, but is typical at the more well kitted out and well maintained strips like here (other examples would include places like Crowfield etc.) nice strips cost cash to maintain and Rayne Hall is a very nice flat bit of grass. Just enough time for a cup of coffee / tea and then it was back in the plane to head for home. I tend not to stay very long at farms strips, unless there’s something really cool in the hangers (there actually is more often then not though!) then 20 minutes or so and you’ll be running out of things to talk about. Taking Off: Runway 27 and back to home. Normal short strip take off, 10 degrees of flaps, get as far down the runway as you can without bashing the tail on anything. 2000 RPM (personally I’ve got into the habit of having a little bit more, I prefer now to have about 2,100-2200 RPM – I personally find it just helps get it rolling on grass that touch better) held on the brakes. The airspeed came up to 55 knots really quick actually, rotating I climbed away at best rate of climb speed (64 knots). Even if you don’t have to do this, I prefer to at grass strips just to stay in the habbit of doing so – a lot of short strips have pylons and stuff at the other end where you really want to max out your height gain / ground distance used ratio. The flight home was a very simple nav. the same thing as to Braintree but in reverse and largely uneventful. Somewhere around Sudbury we saw a plane doing aerobatics with smoke on. I decided to announce my position to anyone on Wattisham Approach frequency just in case. All in all Rayne Hall Farm is a cool little strip, it took me a bunch of calls to get PPR and the gods were a pain with respect to the weather but I finally got it in the log book. 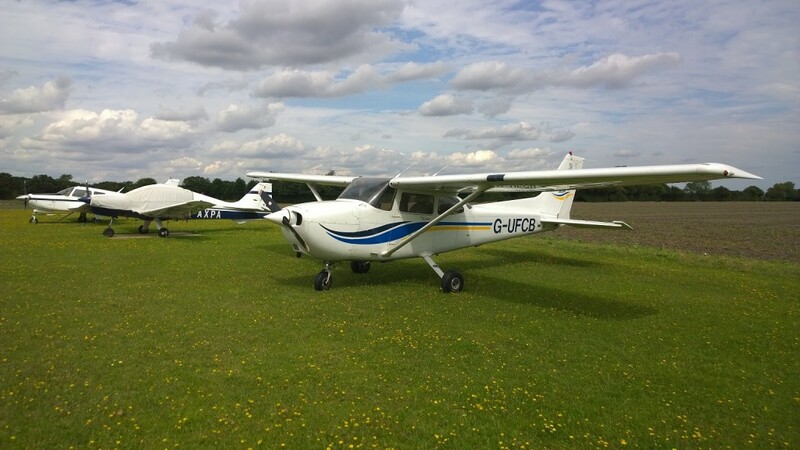 A great place if you’re looking for a farm strip with some contingency distance and no major challenges (It’s not Easton Maudit or Tower Farm by any stretch) so a good place to get some short landing practice in at – but it’s also got regular users so watch out for those ultra lights and others which perhaps fly in an out of there every weekend. I suspect their visitor traffic is so low that it’s easy to assume there’ll never be anything coming etc. This entry was posted on Wednesday, March 23rd, 2016 at 10:13 pm by PHC	and is filed under Flights, Post PPL. You can follow any responses to this entry through the RSS 2.0 feed. You can skip to the end and leave a response. Pinging is currently not allowed.